Can Siri Sit on an Older Device? Have you met the latest personal assistant? If not, let me introduce you to Siri. She is the newest digital assistant that was introduced by Apple. People are intrigued with her ability to answer your questions. She has been all over the Internet and she is the force behind many jailbreak tweaks. The big thing right now is that people want to be able to use Siri on their older Apple devices. There are all types of developers out in the developer world that are trying to get Siri to work on these older devices. Some of the attempts have been fruitless, while other attempts have just recently become somewhat successful. The attempts have even tried to make that occur on non-Apple devices such as on Android devices. So is there a way to get Siri on your older Apple devices? Actually, the answer is yes, however, you must be careful. There is a Twitter user who has been able to do this. He took a brand new iPod Touch and restored the iPod from the previously backed up data of an iPhone 4S. 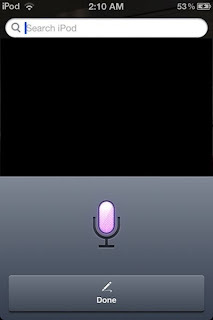 Once the restore was completed, Siri was found on the device. Now it is extremely important to note that there were a lot of bugs and the device crashed a lot and he had to restart it each time that it crashed. When you do the backup, there is a problem because the device is unable to connect to Apple’s server so most of the most important features do not function. However, the interface is actually there. Our Twitter experimenter also ran the restore on his Verizon iPhone 4. He had the same results. He had a Siri interface that crashed quite a bit. He did get a lot of flawless dictation support. Since it is possible to take the restore this far, it might only be a matter of time before a developer takes it the rest of the way. Even though it can be done, you must remember that it is really a non-functioning Siri at this point. 0 Respones to "Can Siri Sit on an Older Device?"